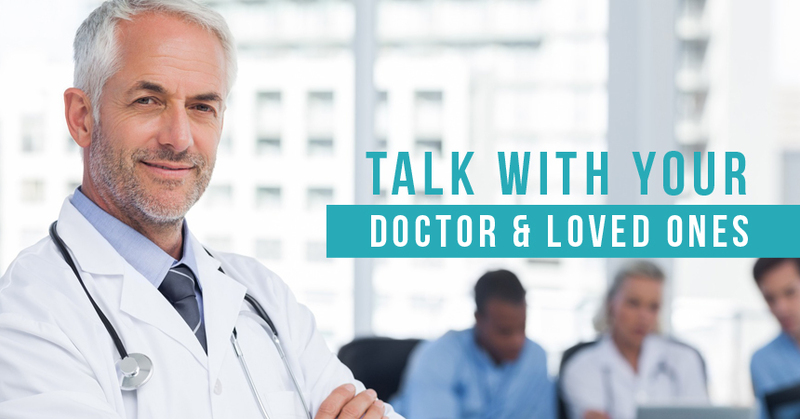 Talking with your doctor about health issues can be, well, a smidge uncomfortable. But sometimes approaching your loved ones -- husband, wife, father, mother, brother, sister -- about their health issues encouraging them to take proactive steps to a healthier lifestyle can be downright awkward. But neither has to be. When it comes to your heart health and the health of your loved ones' hearts, no amount of awkwardness should keep you from tackling this important topic. Before adding Ubiquinol to your daily health routine, it’s important to talk to your doctor to discuss how Ubiquinol can help improve heart health, boost energy levels and protect against free radicals, especially if you are over the age of 40. Once you are 40 years old or older – sometimes even in your 30s – your body’s ability to produce and metabolize CoQ10 decreases, putting you at a higher risk for heart disease, high cholesterol and high blood pressure. Before you go to your doctor’s office, be sure to download the helpful fact sheet with a list of questions to ask your doctor. As you’ll learn in the fact sheet, Ubiquinol is important for your body on multiple levels. It’s the active, antioxidant form of Coenzyme Q10, which your body naturally produces. It helps promote heart health, plays a vital role in the production of cellular energy, and can help protect the body's cells from oxidative stress associated with the aging process and many other age-related conditions. The first thing you should discuss with your doctor is your cholesterol. The only way to detect high cholesterol is to have your blood checked by your doctor, and when that occurs, ask him or her what your numbers are. If the level of lipids (fat) in your blood is too high, especially as you get older, it can lead to buildup in your arteries, making it harder for blood to pass through. Does your diet include a lot of food that comes from animals? Are you over the age of 40? Are you inactive or have a family history of high cholesterol? Those are all potential causes of high cholesterol and should be discussed with your doctor. Do you ever suffer from severe headaches, fatigue, confusion, vision problems or chest pain? If so, it’s important to talk to your doctor about checking your heart beat to see if it’s irregular, as well as check your blood pressure levels. People with high blood pressure are more likely to develop coronary artery disease because the pressure puts added force against the artery walls. Over time, this pressure can cause severe damage to the arteries, and they will be more likely to become narrowed and hardened by fatty deposits. Studies have shown that Ubiquinol is beneficial to the overall cardiovascular system as well as the heart, which has higher concentrations of Ubiquinol in its tissue than any organ in the body. In fact, because Ubiquinol is readily available in the body, unlike conventional CoQ10, it is better for your heart and overall vascular health. But as people age, heart health becomes even more important because our bodies begin to lose some of their natural ability to sustain the processes crucial to maintaining a healthy body. That includes the body’s natural ability to produce CoQ10 and convert it into Ubiquinol -- the form it must be in for our bodies to use it in the cellular energy production process and as an antioxidant to protect against free radicals and oxidative stress. Your doctor isn’t the only person you should be talking with about Ubiquinol. Even after you discuss with your doctor whether Ubiquinol is right for you, it’s important to talk about its importance and positive effects with your loved ones who are 40 years old or older. As individuals reach the age of 40, their bodies begin to produce less CoQ10 and become less efficient at converting it to Ubiquinol. Not only do 40-year-olds begin to produce less CoQ10, but they are at a higher risk for heart disease. According to the Centers for Disease Control and Prevention, 71 million American adults have high levels of LDL cholesterol, which is known as “bad” cholesterol. Men over the age of 45 and women over the age of 55 are at an increased risk of having high cholesterol. Alhough efficient in lowering cholesterol levels, there are side effects to taking statin drugs that your loved ones need to ask your doctor about. Statins can cause muscle damage, raise liver enzymes, and cause nerve damage. Statins can also deplete your body’s levels of CoQ10 and Ubiquinol. This is because statin drugs are designed to inhibit the body's production of cholesterol, and cholesterol is formed via the same pathway as Coenzyme Q10. If your loved ones are taking statin medication, be sure to have them ask their doctor about introducing a Ubiquinol supplement into their daily health routine. Ubiquinol can counteract decreased CoQ10 levels associated with statin medications. Has your husband or wife had cancer or diabetes? Unfortunately, it’s not just cholesterol-reducing statins that deplete Ubiquinol levels; some diabetes and cancer medications can also lower CoQ10 and Ubiquinol levels. Even drugs as common as antacids, antidepressants and some antibiotics can reduce Ubiquinol levels in the blood. Encourage your loved one to get a physical exam and ask the doctor about taking a Ubiquinol supplement, which can restore normal CoQ10 levels and possibly alleviate other side effects of these medications. Once you or your loved ones have discussed the benefits of taking Ubiquinol and have decided it is a good choice for you and your overall health, ask your doctor how much you should take. As a general guideline, starting with 200 mg to 300 mg per day for the first two to three weeks is a good way to raise the Ubiquinol levels to a normal range. After that, 100mg per day is recommended to maintain optimal Ubiquinol levels. However, every person is different, so be sure to ask your doctor what the right dosage is for you.